Who wouldn’t? Sweet and clear in the high tones, every Cloos fife is surrounded by a mystical aura of heroic young men dressed in blue bidding loved ones farewell as they march off to a quite un-civil war, and all this to a sprightly tune that may indeed have been played upon the very fife now held in your hands…or so auction dealers would have us believe. In truth, the Cloos legend is related only peripherally to a war, and it is not the American Civil War. Its provenance, actually, is tied to the post-War development of civilian fife and drum corps. These home-grown marching bands provided a market for Cloos fifes that outlasted the company’s sale in 1946 and eventual demise of the brand some 20 years later. 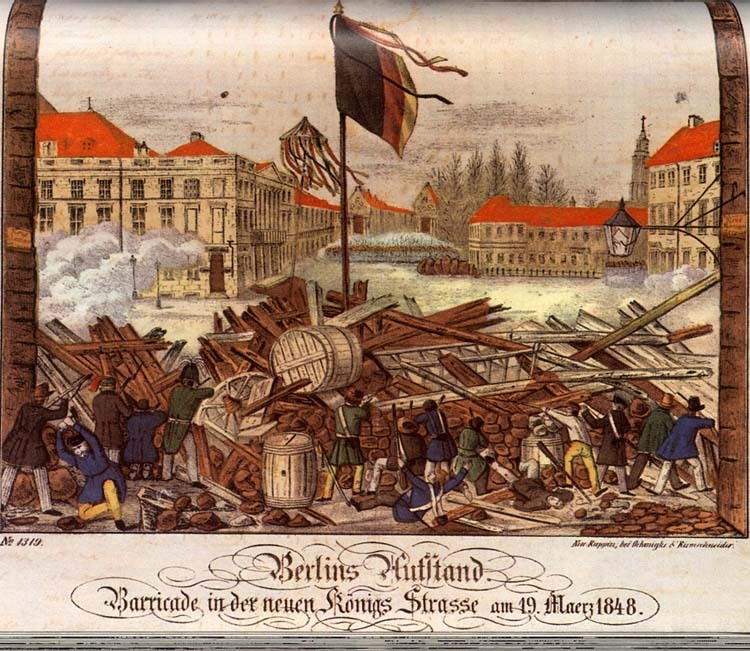 It was the German Revolution of 1848, a grassroots effort to unify the German nation-states, that prompted a decade-long exodus of Forty-Eighters to other countries, including the United States. It was around this time (1857) that George Cloos arrived in New York City to live with Gotthard Cloos, on Remsen Street, just south of and across the river from “Little Germany.” Gotthard was a tailor, not a flute-maker, but he was evidently well acquainted with one by the name of William Bauer. It was Bauer (apparently no relation to the Chicago manufacturer Julius Bauer) who sponsored both Gotthard and George for citizenship in 1860 (Bauer himself had been sponsored a few years earlier by another flute-maker, Charles G. Christman), thus beginning a friendship with George Cloos that would last a lifetime. In 1870 the Cloos families were still on Remsen Street, but the Gotthard Clooses would soon remove to Buffalo and the George Clooses to a new home to the east in the Williamsburg section of Brooklyn. There George Cloos would live and work for the rest of his life. The downturn began in the 1930s. The second-generation Cloos businessmen were aging out, and the market opportunities for a narrowly focused family business were dwindling. With the Great Depression in full swing and the purchasing power of amateur marching bands in doubt, the Cloos name all but dropped from the trade journals, and in 1933 Fred G. Cloos, who had succeeded his father and grandfather, left the business for a career in insurance. Meanwhile, the Clooses no longer jobbed exclusively to the trade and opened their factory doors to walk-in customers. In 1946, the company ceased production; when purchased by Penzel & Mueller of Long Island City, the new owners promised that “the name ‘Cloos’ and the world famous ‘Crosby Model’ trade marks will [continue to] be used.” They even named the elderly Fred Cloos an executive. However, business was no longer brisk, and after a few years the new owners quietly closed up shop, depleting the stock early in 1969. The history of Cloos fifes is not easily chronicled since business records have not been located and public records, city directories, newspapers, and trade journals tell an incomplete story. When George Cloos (“Closs”) arrived in New York he was a joiner, but 3 years later he told census-takers he worked at flute-making. He did not own a business at this time, so he must have been employed by any one of a number of woodwind makers flourishing in New York. We might surmise that he worked for William Bauer who, according to tax records, operated a small musical instrument-making shop, but in any event, Cloos established his own flute-making business in 1862, or so his later advertising tells us. In a 4-page catalog produced for the trade, we are told that “the Manufacture of Flutes and Piccolos” was entrusted to his eldest son, William; his second son, Frederick was in charge of the “clarionets.” Although undated, this catalog was likely produced around 1902, the year that Cloos announced to readers of the Music Trade Review that his sons were now officially part of the company. 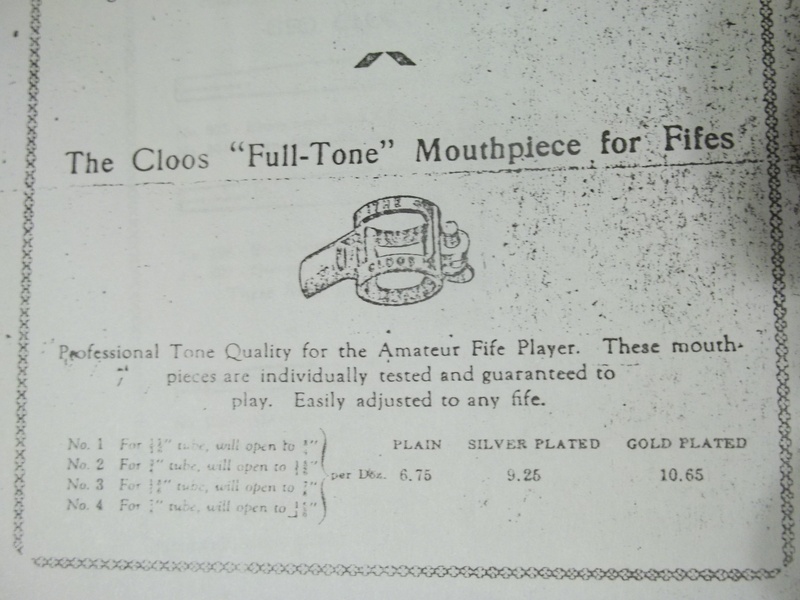 In 1928, in an effort to “increase interest in playing the fife,” the company announced the invention of the “Full Tone” mouthpiece made of “tasteless metal” and “guaranteed to play,” available with a plain finish or plated in silver or gold. Mouthpieces were colloquially called “cheaters.” Despite the promise of a “full tone,” a fife played through a mouthpiece is not nearly as powerful and strong as one played directly through the embouchure. Courtesy Library of Congress. Snap-on mouthpieces such as this one (top, left) were custom-made by local tinsmiths. The Cloos “Full-Tone” (top, right) copied a late 19th c. manufactured standard but used no pewter in its construction. 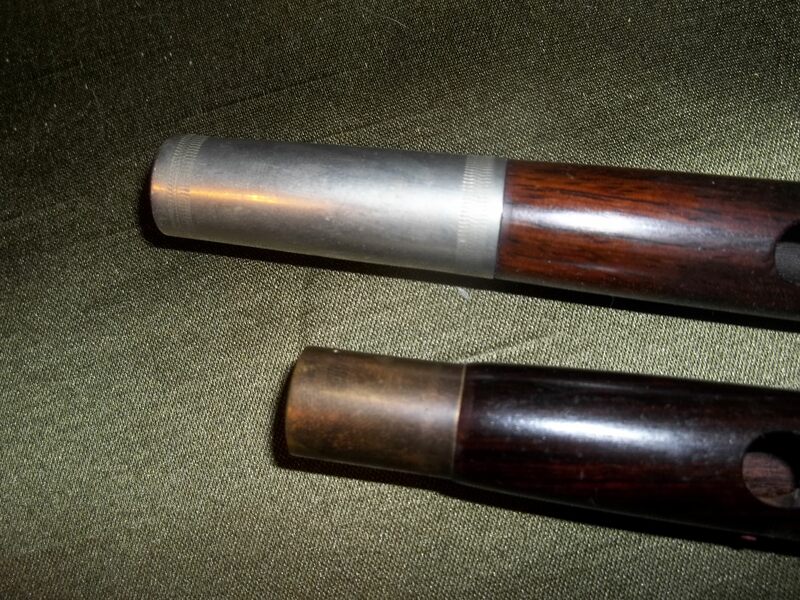 The rosewood fife shows wear from a long use of a round mouthpiece like the Full-Tone. The mouthpiece on the cherry fife is secured with linen string, the brass screw having been lost. Author’s Collection. 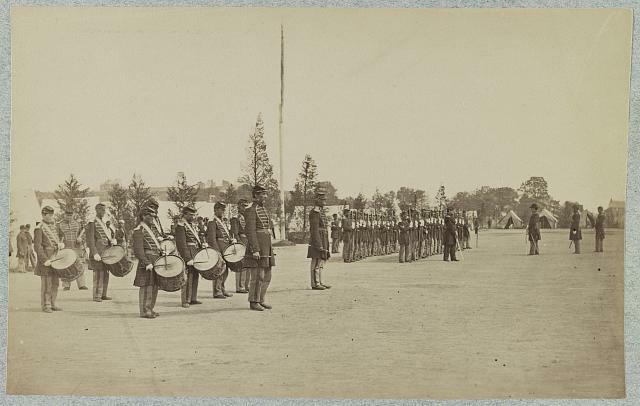 Field music in company formation, unidentified, ca 1860-1865. Image Courtesy Library of Congress, http://www.loc.gov/pictures/resource/ppmsca.33186/, accessed November 11, 2012. So, when did Cloos begin large-scale fife-making; more specifically, when did he produce the Crosby Model? The best answer, which is not very precise, is this: when it became profitable to do so. That did not happen for some years after the Civil War had ended. Prior to this, the market was quite limited, since fifes were of little use to anyone who was not a military musician. A member of the flute family of woodwinds, fifes have a relatively short sounding length that results in high, shrill tones entirely unsuitable for indoor use; however, they pair nicely with the field drum, both of which are loud enough to be heard over the din of marching men. Thus fifes and drums (“field music”) were used in the military camp to relay signals and on the march to establish and maintain cadence. The brass-ferruled fife is a pre-Crosby Cloos, which could have been made any time before ca 1875 (or as late as the 1920-30s, when they were offered for sale just in time for the Washington Bicentennial). The other, with nickel silver ferrules, is a Firth & Pond, ca. 1846. Despite the outward differences and the nearly 30 years that separate them, both fifes have nearly identical sounding lengths and are straight-bore, even-holed instruments that did not incorporate any of the acoustical improvements found on parlor and concert flutes made during the times these fifes were produced. Author’s Collection. had with other woodwinds, and why should they? There was little civilian interest in purchasing fifes, and the military market, excluding the war years, remained small and undemanding, so much so that army specifications continued to call for old-style instruments, despite their limitations, as late as 1889. Thus, makers had no incentive to spend time or money on improving fife design. There is no evidence that Cloos made a significant number of fifes (and none of the Crosby Model) during his early career. Neither his name nor his firm have been found on surviving government contracts, suggesting that he did not supply the army with fifes during the Civil War, although other New York makers did, including William Hall & Son and Firth & Pond. Without these lucrative contracts, Cloos could not have supported himself and his growing family by wholesale fife production. Existing records suggest he continued making flutes and a maybe few traditional-style fifes until 1873, when an expanded product line was reflected in his city directory listing; he now manufactured musical instruments, not just flutes. 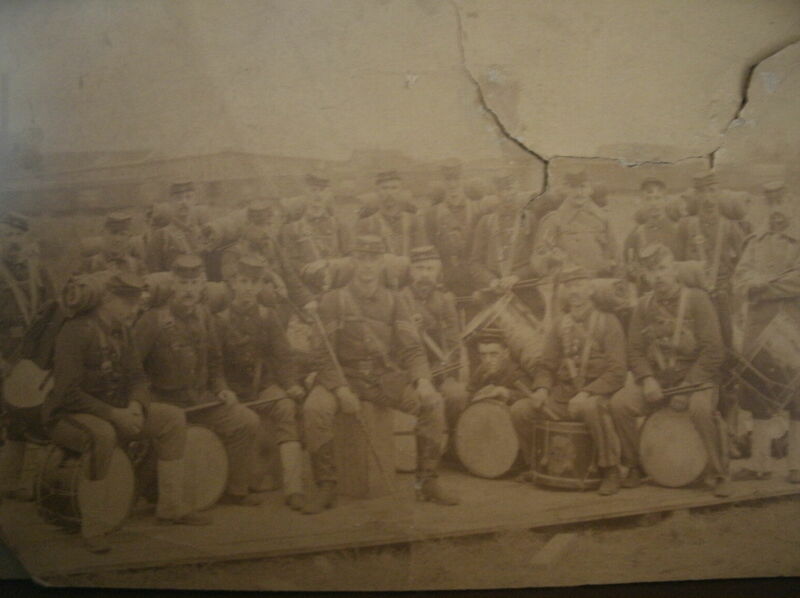 Moodus Drum and Fife Corps, left, undated but shortly after they acquired their first uniforms (founded 1860, Moodus, CT) Author’s Collection. By that time, however, things were changing rapidly. The passage of time, which had romanticized the postwar image of the “boys in blue” as saviors of the union, plus the national pride inspired by the Centennial celebrations of 1876, spurred formation of amateur community bands (“corps”) comprised solely of fifes and drums. This occurred alongside technological advancements in warfare that would soon render the military field music obsolete. Now the civilian market for fifes outstripped even wartime military demand as more and more parades, ceremonies, and public commemorations included fife and drum corps in their line-up. As fifers played in concert with and marched alongside other types of bands, though, they became acutely aware of the deficiencies inherent in the traditional fife, and they looked for an improved instrument with a truer pitch. This is the market that likely prompted George Cloos not to just produce fifes (he was already doing that) but to produce better ones and more of them. Certainly the profuse survival of Cloos/Crosby fifes and Fred Cloos’s assertions in the Music Trade Review confirm this supposition, even if direct documentation cannot. Chas. 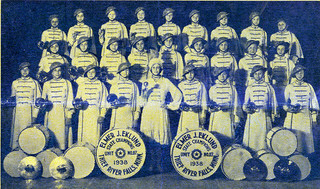 T. Kirk Fife, Drum, and Bugle Corps in 1938 (founded 1899, Brooklyn, NY) Author’s Collection. Odell M. Chapman Continental Fife and Drum Corps, ca 1922 (founded 1918, Willimantic, CT, having split from the Thread City corps). Renowned drummer, Frank Fancher, was the lead musician. The Crosby Model fife differed from its contemporaries in several ways, one of which was its ferrules. Ferrules are the decorative metal bindings applied to either end of the fife to prevent the wooden body from splitting. Initially ferrules were made from sheet metal, usually brass, rolled to a snug fit and finished with a burnished seam. They were then punched with a special tool to prevent the ferrule from sliding off. Sometime around 1840 “German silver,” an alloy of copper and nickel (and sometimes zinc) replaced the customary brass, and makers found that cutting ferrules from metal tubes was less expensive and more efficient than rolling them from sheets. However, tubing could not be used to produce the long tapered ferrules that Cloos used on the Crosby Model—that is, not until machinery designed to produce seamless tapered metal tubes was available. Cloos did not have these machines in 1870, but by 1880 he had acquired enough to keep himself and two young sons busy spinning tapered ferrules. The seam on this late 18th century ferrule, far right, is so finely burnished that it is almost invisible. However, it runs in line with the edge of the embouchure. Ferrule from head end of Eisenbrandt fife (middle, ca. 1812) showing tooled “pince” or “dimple” to prevent loss as the ferrule loosened over time. Crosby Model ferrule (left, top) and pre-Crosby Cloos ferrule (left, bottom). Neither are seamed. 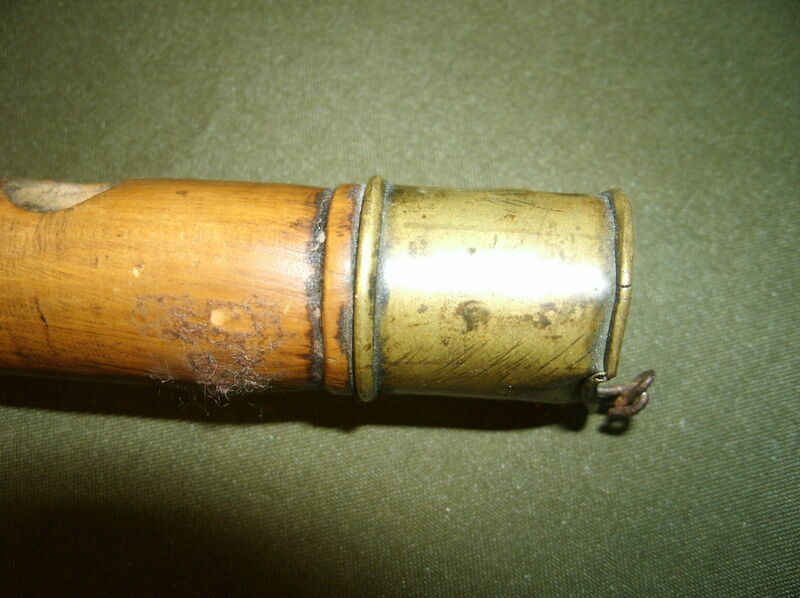 The top ferrule was “spun” to achieve its conical shape; the brass ferrule is cylindrical and likely cut from metal tubing. Author’s Collection. Charles Nicholson, 1834. Courtesy Wiki Images, accessed September 14, 2012. This Nicholson flute, right, was made by Clementi, a London maker. More important changes occurred in tone-hole design. Cloos and his fellow woodwind makers knew that placing six relatively small, equal-sized tone holes in an equidistant pattern along a woodwind body would negatively affect certain pitches. Accomplished players knew this, too, and compensated either by altering the force or direction of the airstream or rolling the instrument in or out as required. While many makers at this time decided to adopt (or adapt) the Boehm system to improve their flutes and clarinets, no one bothered to improve fifes. Neither did Cloos, whose early fifes feature the typical “even” tone holes. However, when his thoughts turned to producing a better fife, he shunned both traditional tone holes and the Boehm system in favor of a Nicholson-style pattern. Charles Nicholson (b. 1795, d. 1837) was the flautist whose playing in 1831 had charmed Theobold Boehm and inspired both to improve flute construction. The simplest explanation of Nicholson’s varied tone-hole design is that it altered the sounding length of certain pitches, thus improving the off-tones produced by instruments made with even-sized holes. He also enlarged the tone holes and the embouchure, which resulted in more powerful acoustics. Cloos applied similar changes to his new-style fife, probably as early as 1880 but certainly by 1893, when Lyon and Healy offered Crosby Model fifes for sale, a mail-order bargain at $1.50 each. The variably sized tone holes of the Nicholson flute. Neither Cloos nor Crosby copied the Nicholson design, but they were both influenced by it. Courtesy Terry McGee, McGee-Flutes Research Collection, http://www.mcgee-flutes.com/collection.html, accessed September 14, 2012. Court Street, Boston, ca. 1850-55. 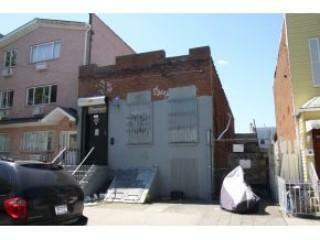 In 1861, Walter Crosby worked from #59, upstairs from Gilmore & Russell’s music shop located at 61 Court Street. The “Gilmore” in Gilmore & Russell was the famous band leader, Patrick S. Gilmore, who composed “When Johnny Comes Marching Home.” Courtesy Boston Public Library, Print Department, via Wiki Images, http://upload.wikimedia.org/wikipedia/commons/a/a3/1855_CourtSt_Boston_BPL_08_02_003376-1_detail2.jpg. Accessed September 14, 2012. 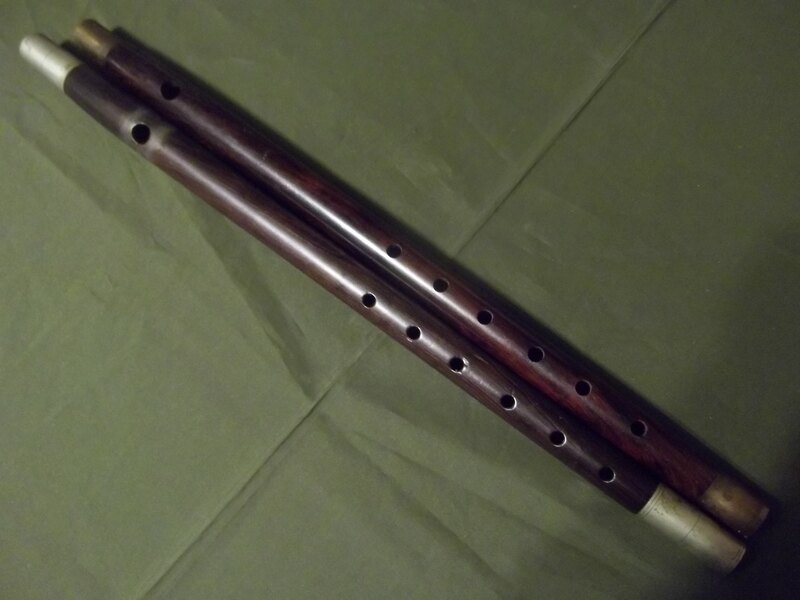 Although Fred Cloos reported that the Crosby Model “originated in the Cloos business,” he failed to disclose that its prototype had been for sale all along in the Boston woodwind shop of its namesake, Walter Crosby (b. 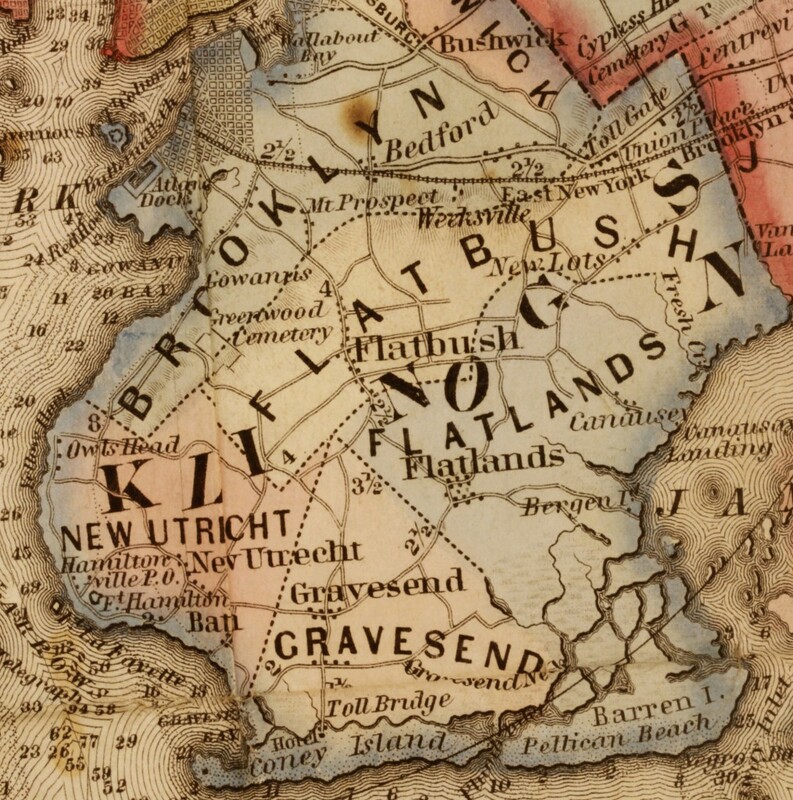 1805, d. 1874). In 1827 Crosby was a woodturner who made umbrellas and toys. He partnered briefly with another turner, Henry Prentiss, in 1829 before both ventured into the woodwind market, Crosby in 1830 and Prentiss in 1834. He did well, with real property worth $10,000 in 1870. He is mentioned only once in Ayars’s study of Boston music industries (1937), but the citation is worth notice: “Possibly the first flutes manufactured in Boston were made by the firm of Walter Crosby, which made the popular Crosby fifes used in the Civil War…” Her statement is inaccurate (William Callender made flutes in Boston before Crosby was born), but she remains correct in that Walter Crosby did indeed make fifes. Their war-time popularity is doubtful, since there are no extant contracts to indicate that these attracted the attention of any military quartermasters, but they did attract the attention of George Cloos via a series of somebody else’s short-lived business enterprises that eventually involved his eldest son. This began in 1876, when George’s old mentor, William Bauer, traveled to Boston. His son Henry had spent the previous year there making musical instruments, but together they formed a new business, William Bauer & Son, at 103 Court Street, just a short walk from the old Crosby shop at #59. 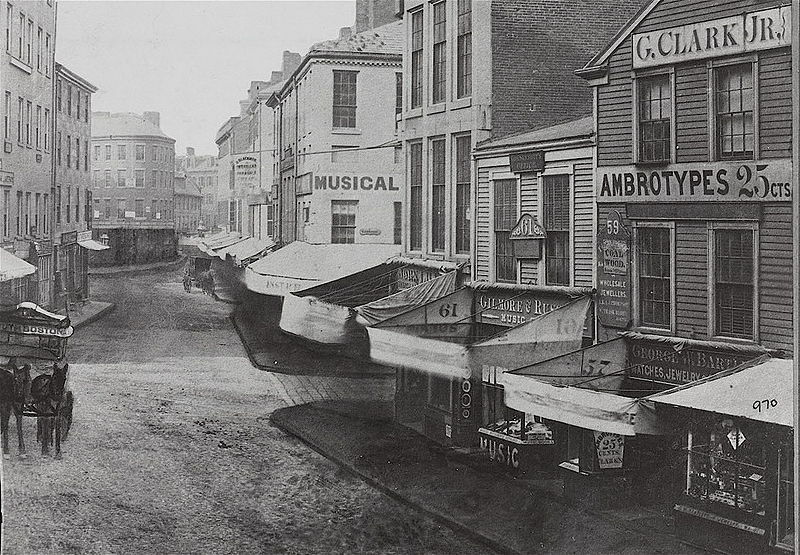 There the Bauers made, sold, and repaired musical instruments until 1878, when Henry returned to New York. William worked alone until 1880 when another son, Emil, joined him. 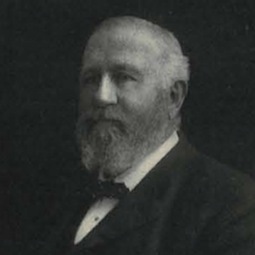 This second father/son alliance ended with the elder Bauer’s death in 1882, leaving Emil to run a solo business, perhaps from his Ruggles Street home, and this in addition to his employment as a clerk for John C. Haynes. However, 1883 found him again on Court Street, repairing instruments for the Envers brothers, and it was this shop that in 1885 became “William H. Cloos, Clarionets, Flutes, and Piccolos.” Whether Emil partnered with Cloos or worked independently is not clear, but in any event, Ayars reports that Bauer sold out to August Damm in 1888, the same year that William Cloos returned to Brooklyn to supervise flute production at his father’s factory, which he did until his death in 1904. What emerges from this convoluted story is that George Cloos, either through his son or his old friend William Bauer, clearly had the opportunity to examine Crosby fifes, perhaps as early as 1875 or ’76. That the one was the prototype for the other is undeniable, even had Cloos not retained the Crosby name. Both are made from dark hardwoods, and each features a Nicholson-type tone hole pattern that varies in size and placement. Lloyd Ferrar, in a detailed physical study comparing the Crosby fife with the Crosby Model (Woodwind Quarterly, Issue 12, n.d.), identified a few structural vagaries, but these are inconspicuous, both visually and acoustically. In fact, there are just two easily detectable features separating Cloos’s fife from Crosby’s (besides, of course, the makers’ marks): One is the design of the tone holes and the other is the ferrules. http://lcweb2.loc.gov/diglib/ihas/loc.music.dcmflute.0944/default.html, accessed September 14, 2012.
http://memory.loc.gov/cgi-bin/map_item.pl?data=/home/www/data/service/music/dcmflute/1200/1246f1.jp2&title=DCM+1246:+++George+Cloos+/+Fife+in+A-flat+(B-flat)&style=dcmflute&itemLink=r?ammem/dcm:@field(NUMBER+@band(1246%20dcmflute)), accessed September 14, 2012. John C. Haynes was one of the many retailers who included Cloos products in their inventory of musical goods for sale. Walter Crosby used shorter, widely tapered ferrules that bear marks of handwork; ferrules on the Crosby Model are longer, also tapered but seamless, turned on the metal spinning machines the Clooses were using by 1880. The result is a perfect combination of George Cloos, maker of fine woodwinds, and George Cloos, shrewd businessman. As a maker, he recognized the performance capabilities of Crosby’s fife and salvaged it from obscurity with the Crosby Model. As a businessman, he personalized the instrument and streamlined its production so that it could be readily prepared and sold with impunity once Crosby’s shop had closed for good, which it did after its owner’s death in 1874. Still, Cloos must have realized his moral obligation to the originator, which might explain why he retained the Crosby name. In any event, the Crosby Model became an instant best-seller as it satisfied the market demand for an improved, reliable instrument and was wholesaled to various dealers, including the John C. Haynes Company. 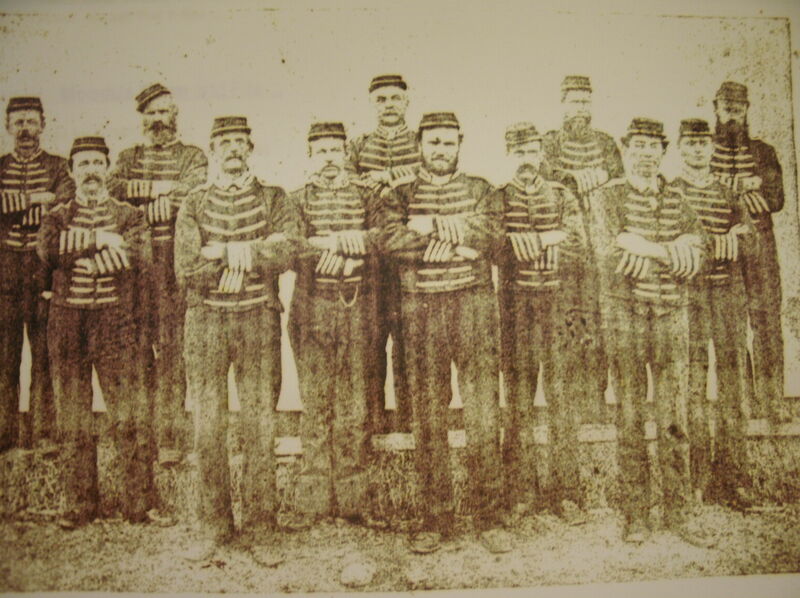 The 22nd NYSM in August 1892, activated to maintain order during the Switchmen’s Strike in Buffalo. Author’s Collection. The success of the Crosby Model enabled the Cloos factory to ride the crest of a mighty wave of interest in fifing created by the burgeoning drum corps market. Fife and drum use was no longer confined to the military, although field music continued to abound in the postwar New York State Militia. These groups found companionship in the innumerable quasi-military civilian corps that sprang up in just about every city borough (especially the well-defined neighborhoods of Brooklyn) plus in the hundreds of youth corps sponsored by the Boy Scouts and the CYO (“Catholic Youth Organization”). Beyond Brooklyn to the east, Connecticut had its own tradition of “ancient” style fifes and drums, which flourished alongside their more modern counterparts comprised variously of fifes, flutes, drums, and/or bugles. The activity in New York and Connecticut, however, was just a microcosm of a nationwide trend that had begun with the commemorative G.A.R. corps founded by Civil War veterans and their progeny and continued with those spawned by the successive patriotic frenzies created by the Spanish American War, World War I, and the formation of the American Legion. 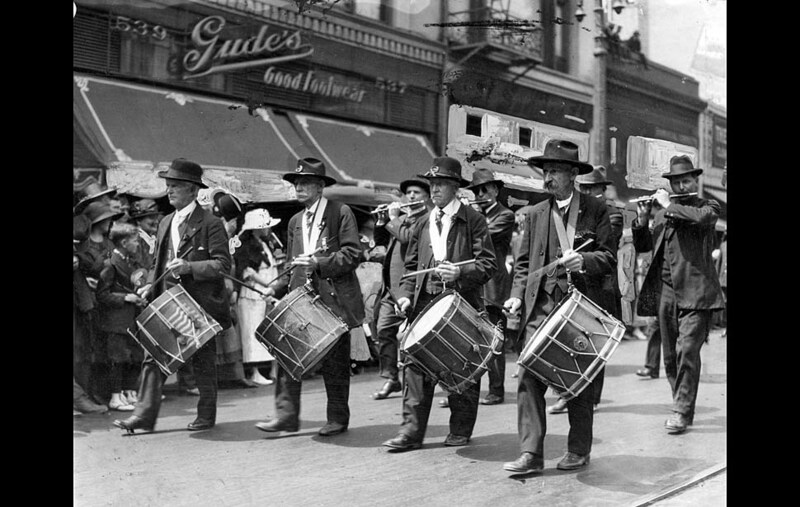 A GAR corps, right, leading the Memorial Day parade in Los Angeles in 1927. The right-most fifer (besides being out of step) is playing on a Crosby Model Cloos, as is the fellow next to him; the two fifers to the left are using short-ferruled fifes. Image courtesy Los Angeles Times Photography, http://framework.latimes.com/2012/05/26/memorial-day-1911-1929/#/10, accessed September 14, 2012. An American Legion ladies’ corps, left. Google Images, accessed September 14, 2012. 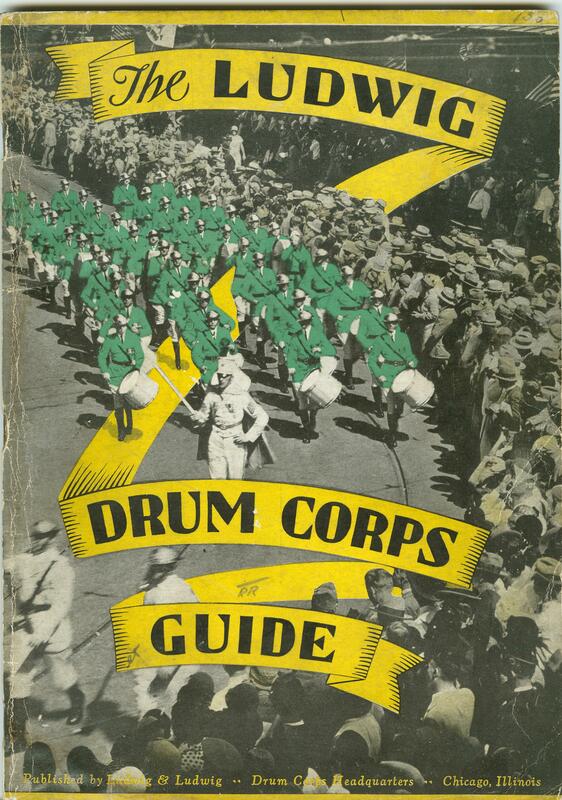 In fact, at the height of Legion fervor, William Ludwig published a pamphlet advising the best way to organize a drum corps, details of which were published in the Music Trade Review in 1926. One of the many Ludwig publications directed towards the drum corps market. Author’s Collection. Of course, no corps would be complete without its quota of Ludwig drums, and he was less than enthusiastic about fife sections, which he thought were best used as “a relief unit for the bugles.” Nonetheless he urged fifers to buy Crosby Models because they are “designed especially for corps work and [are] used by more corps than any other fife.” By this time, he proclaimed, it had become “the old-timer’s standby. It was no wonder, then, that Geo. Cloos, Inc. scrambled to fulfill orders. It was this very focus on all-things-fife that ensured the demise of the Cloos factory. 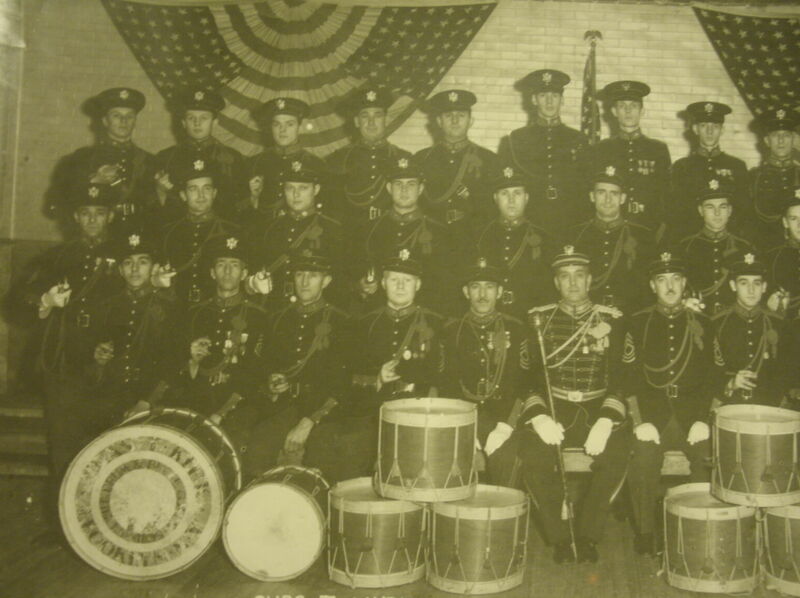 In their efforts to become the #1 supplier of drum-corps fifes and accessories, the Clooses ignored the danger signals emitting from the otherwise thriving musical market of the 1920s. Flutes were no longer the parlor instruments of choice; those who continued making music in the home preferred pianos. Stringed instruments (guitars, mandolins, and banjos) now dominated the small goods trade, so much so that Emil Bauer bid good-bye to John Haynes to work in banjos. Military wind bands continued to flourish; however, they had long since discarded woodwinds in favor of brasswinds. In fact, the active passion for making music was fast succumbing to the passive fashion of listening to it as families nationwide rearranged their furniture to accommodate “talking machines” (gramophones and phonographs), radios, and “player pianos” that required no musical training to operate. 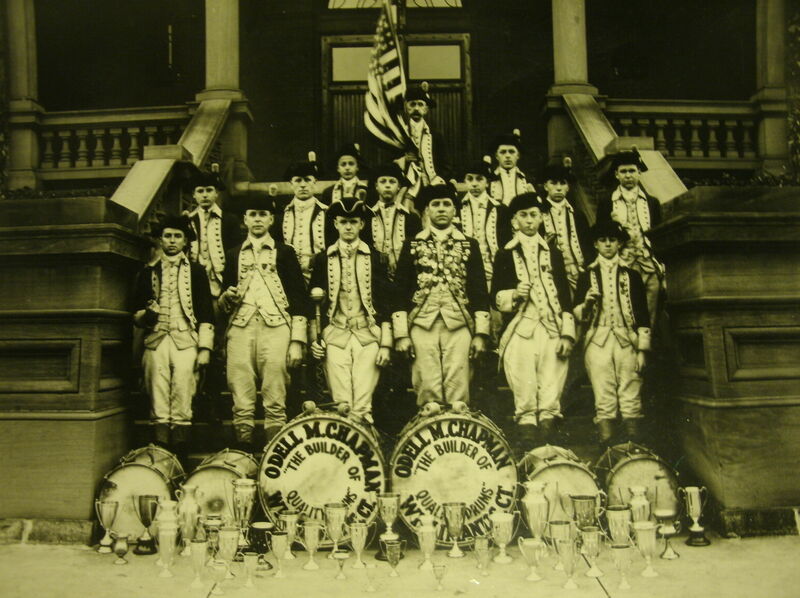 One could listen to fife and drum music, too, such as the “Uncle Sam Medley” played by the National Guard Fife and Drum Corps (1917) http://cylinders.library.ucsb.edu/mp3s/6000/6344/cusb-cyl6344d.mp3. 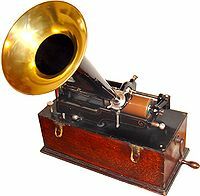 Recorded on a Gold-Moulded cylinder, it would be played upon a machine such as this one pictured here, courtesy of Wikipedia, http://en.wikipedia.org/wiki/Phonograph_cylinder, accessed September 14, 2012. MP3 file courtesy of Cylinder Preservation and Digitalization Project, University of California, accessed September 14, 2012. The once-proud home of Geo Cloos, Inc. Some manufacturers responded by dropping their unprofitable woodwind lines and retooling for small strings or pianos. The businesses of unlucky others failed or were subsumed by the large publishing houses, most notably that of Oliver Ditson. The Cloos products were given another chance briefly around 1932 with the Washington’s Birthday Bicentennial and again when the company was acquisitioned by Penzel & Muller but to no avail. The fife market, now much smaller and concentrated in metropolitan New York/New Jersey and the Valley Shore area of Connecticut, patronized local makers such as Ted Kurtze, T. D. O’Connor, and Henry “Ed” Ferrary or purchased a new kind of fife designed by the first of the revisionist makers, John McDonagh. The old Crosby Models were retired to attics, basements, and inaccessible closet shelves, emerging decades later as misunderstood eBay offerings but to those in the know, relics of the truly golden years of fifing and drumming. Copyright November 2012, History of the Ancients Dot Org. All rights reserved. This entry was posted in All About Fifes and tagged All About Fifes. Bookmark the permalink. P.S. Did you notice the GAR fifer, the one way to the right, is out of step? He’s probably rolling over in his grave right now. . . Thank you so much I have just picked up a GEO.Cloos Crosby fife at a swap meet and this really help me. I’m hoping you can give me some information about two fifes that I have for sale from my father’s estate. Both have the imprint of Geo. Cloos in a semi-circle above Crosby. What I find unusual is that the ferrules seem to be made of plastic. Is it Bakelite? I would appreciate your input on how old they are and a some sense of value. Nice-looking instruments! They appear to be typical Crosby Model Cloos fifes — except for the ferrules. Not that the company didn’t make fifes with these “plastic”-type ferrules, they certainly did…but did they use Bakelite? or some type of hardened rubber? Bakelite is actually an early type of plastic. Physicist-types will recognize it as “thermosetting phenol-formaldehyde resin” (huh??? ), which is produced when phenol reacts with formaldehyde under certain conditions of heat and pressure. For our purposes, though, all we need to know is that it wasn’t invented until 1907. So, if the ferrules on your fife are truly Bakelite (or a similar type of resin), that pretty much gives us a “no earlier than” date for your fifes. However, if they are made of “hard rubber,” that’s a different story. Hard rubber is a natural substance that in its earlier years was called “vulcanite” and “ebonite,” produced by a process patented in 1844 by its inventor, Charles Goodyear. By the 1860s it was widely used for all kinds of things, including musical instruments. 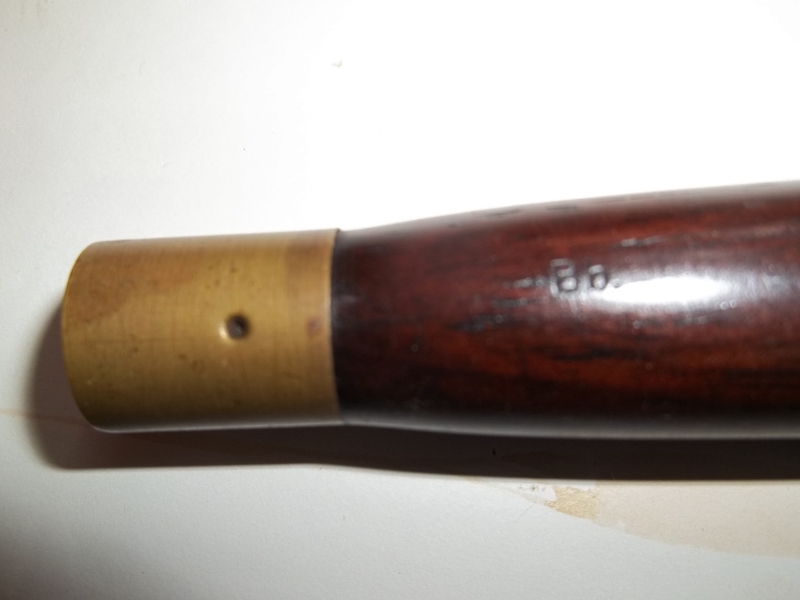 So, it is entirely possible that your unusual ferrules were made of hard rubber (I have a Cloos Model fife as well as a knock-off Cloos made in France that were both made from hard rubber, which I suspect dates from around 1920 or so). You can test for the Bakelite by releasing some of the formaldehyde, which has a distinctive odor, except that most testing methods are damaging and some of them dangerous. You could, though, try rubbing the ferrule briskly with your fingers to see if the low heat generated thereby produces the telltale odor of formaldehyde. Or, you could go to the Dollar Store and buy something called “Scrubbing Bubbles.” You’re supposed to clean bathtubs with it, but if you moisten a piece of a cotton ball or a Q-Tip in some and then lightly apply it to the ferrule, it won’t damage the ferrule but it will the cotton, which will turn yellow…why? I don’t know, it just does — and if so, you’ve got Bakelite! Testing for the presence of rubber is more difficult. You could try the brisk-rub-test, in which case the odor produced will be similar to what you smell when you walk into the tire department at Wal-Mart. Another test would involve removing the ferrule and wiping the inside with fine garnet paper or sandpaper. If it produces white (or purple) dust, you’ve got some kind of plastic; if it produces black dust, it’s hard rubber. But why risk the damage? If you do the (harmless) Scrubbing Bubbles test, you either have Bakelite or you don’t. And if you don’t, you probably have hard rubber. What I see in your photos would point to the ca. 1910ish-to-1930ish period, probably toward the end of that period, when drum corps were a dime-a-dozen and the Clooses were doing less wholesaling and much more of a walk-in business, where customers would be attracted to something unusual, like Bakelite ferrules or hard-rubber fifes. In any event, it wouldn’t be much later than the 30s, since during WW II the military demand for both Bakelite and hard rubber products (for use in telephones and other communications devices and equipment) left very little of this stuff available for civilian use, and after the war the Cloos business was just about closed. I’ve got a couple of Cloos sales catalogs from the 1920s and 30s. Offhand I don’t recall these things being advertised therein, but I will check them in the morning and let you know if I find anything in them. I have an all metal fife with what appears to be a bakelite lip plate. There is only one marking on it and that is “Geo. Cloos.” This article was an excellent read but I did not notice anything about metal fifes, they seem to all be made of wood. Do you know anything about when the company made fifes like mine. It was given to me many years ago and I am about to begin playing it in a local civil war band. I would love to know its approximate age. See my article, “This Civil War Fife. . . Isn’t.” Without pictures, I’m guessing your fife looks something like the one I wrote about. 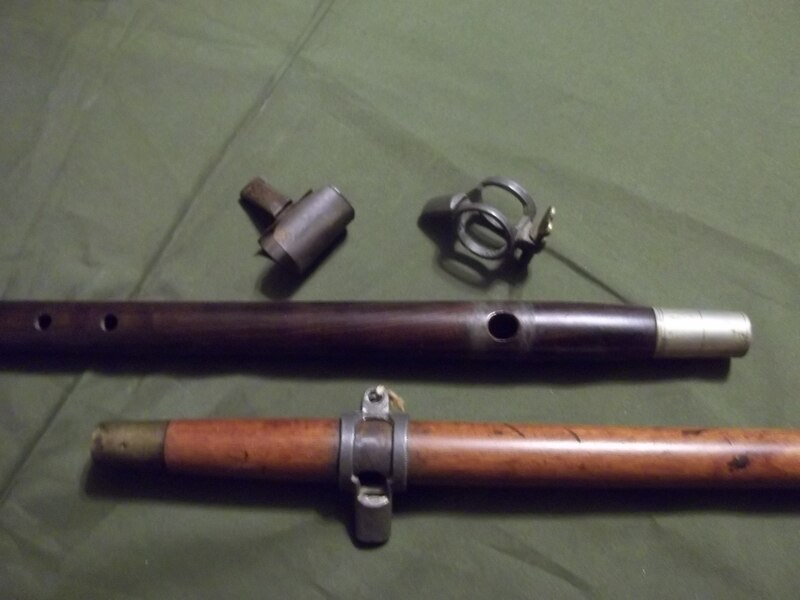 As I said in the article, these kinds of fifes were all over the Cloos catalogs of the mid 1920s-30s. It’s possible they were made earlier, but I have no hard data to prove that. Some people have tried to date these fifes “Civil War,” but it just isn’t possible. That doesn’t mean, though, it is not a good fife. In truth, metal fifes have several advantages over wood. They require little upkeep, just occasional mild soap-and-water (no oiling!). They never split in the cold weather, and their thin bodies produce a bright tone without the “airiness” that a dry wood fife can have. The hard rubber embouchure ring on your fife provides excellent chimney height, which lends a little richness to the tone. Cabinets — no, not the kitchen kind! Governor's Island, an Album of Looking Back — thanks, Ranger Joe! You mean there are other types of marching bands????? DRAM 2012 –Some great perspectives in photograpy!